I'm running on the latest Raspian image and the USB miners are on a powered DLink USB hub. What mining hardware are you using? Please post a sudo lsusb -v and full dmesg output. I am using 5 ASICMiner USB Block Eruptors connected to a DLink Hub (DUB-H7). Like I said before, I ran with the setup fine for a month but recently it has started locking up while mining. idVendor           0x0424 Standard Microsystems Corp.
[    0.084028] hw-breakpoint: found 6 breakpoint and 1 watchpoint registers. [    0.084081] hw-breakpoint: maximum watchpoint size is 4 bytes. [    1.036830] RPC: Registered named UNIX socket transport module. [    1.042876] RPC: Registered udp transport module. [    1.047599] RPC: Registered tcp transport module. [    1.052345] RPC: Registered tcp NFSv4.1 backchannel transport module. [    1.299297] kgdb: Registered I/O driver kgdboc. [    1.362663] Loading iSCSI transport class v2.0-870. [    1.935463] USB Mass Storage support registered. [    2.991827] VFS: Mounted root (ext4 filesystem) on device 179:2. [   22.393393] CIFS: no cache= option specified, using "cache=loose". This default will change to "cache=strict" in 3.7. Have you previously run rpi-update before it started crashing? 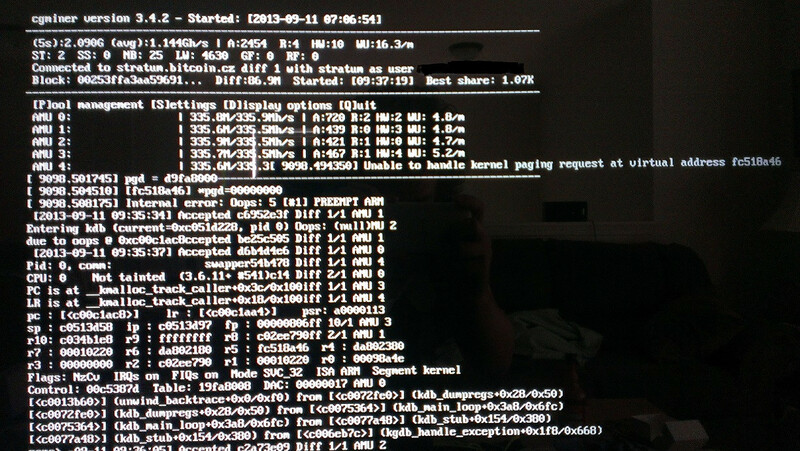 As a next test step that you can do, can you add slub_debug=FPUZ to /boot/cmdline.txt and reboot, then leave it mining? The Pi will be slower but it will catch (and be very noisy in dmesg about) memory corruption. Yes, multiple times following a fresh reboot. I added slub_debug=FPUZ to /boot/cmdline.txt and started mining again. Once the Pi crashes what do I need to supply? Is there a log file somewhere? Once the error happens the entire Pi locks up and a reboot is needed. In theory, the Pi should not crash. If it does, then usually after reboot the /var/log/syslog file should contain most of the dmesg buffer. Of course, take a photo of the screen before rebooting - the crashdump may be of use. try a later version ? what gpu RAM split do you have ? It's a kernel OOPS, not an OOM. The fact that it crashed somewhere inside kmalloc (fairly deep inside the kernel memory allocation routines) suggests that something broke the internal structures of the memory allocator. Usually a buggy kernel driver (or broken hardware) is the cause. I haven't changed the RAM split from the default. I've left it mining over night and it's still mining away just fine. So what exactly does adding slub_debug=FPUZ to /boot/cmdline.txt do anyway? Could my SD Card be crap since it'll get corrupted when doing an apt-get update? It adds additional checks for memory (RAM) corruption issues. There should be something in dmesg by now - can you post (or pastebin) what's in it? [    0.154399] hw-breakpoint: found 6 breakpoint and 1 watchpoint registers. [    0.154465] hw-breakpoint: maximum watchpoint size is 4 bytes. [    1.331763] RPC: Registered named UNIX socket transport module. [    1.337734] RPC: Registered udp transport module. [    1.342538] RPC: Registered tcp transport module. [    1.347261] RPC: Registered tcp NFSv4.1 backchannel transport module. [    1.733091] kgdb: Registered I/O driver kgdboc. [    1.860563] Loading iSCSI transport class v2.0-870. [    2.447824] USB Mass Storage support registered. [    2.802765] VFS: Mounted root (ext4 filesystem) on device 179:2. [   37.560416] CIFS: no cache= option specified, using "cache=loose". This default will change to "cache=strict" in 3.7. [ 3877.103365] Object c1176630: 6b 6b 6b 6b 6b 6b 6b 6b 6b 6b 6b 6b 6b 6b 6b a5  kkkkkkkkkkkkkkk. [15067.359635] Object c124c9b0: 6b 6b 6b 6b 6b 6b 6b 6b 6b 6b 6b 6b 6b 6b 6b a5  kkkkkkkkkkkkkkk. [15851.288082] Object d9828630: 6b 6b 6b 6b 6b 6b 6b 6b 6b 6b 6b 6b 6b 6b 6b a5  kkkkkkkkkkkkkkk. [16631.768961] Object c13ca2b0: 6b 6b 6b 6b 6b 6b 6b 6b 6b 6b 6b 6b 6b 6b 6b a5  kkkkkkkkkkkkkkk. [21434.490703] Object d71070f0: 6b 6b 6b 6b 6b 6b 6b 6b 6b 6b 6b 6b 6b 6b 6b a5  kkkkkkkkkkkkkkk. [25447.386727] Object d9b00ef0: 6b 6b 6b 6b 6b 6b 6b 6b 6b 6b 6b 6b 6b 6b 6b a5  kkkkkkkkkkkkkkk. [27089.781988] Object d70ec7f0: 6b 6b 6b 6b 6b 6b 6b 6b 6b 6b 6b 6b 6b 6b 6b a5  kkkkkkkkkkkkkkk. [31241.992100] Object d9aa07f0: 6b 6b 6b 6b 6b 6b 6b 6b 6b 6b 6b 6b 6b 6b 6b a5  kkkkkkkkkkkkkkk. Use-after-free somewhere in the kernel. I suspect the cp210x driver because there have been no other reports from people using serial port adapters that they've had kernel OOPSes. We recently changed the kernel memory allocator to SLUB for increased performance (incidentally also allowing this sort of debugging) which meant that this bug, which has probably always been there, has crawled into the open. So this is a kernel bug, more specifically a bug in SLUB? I guess now it's just a waiting game for the bug to be fixed in a newer kernel. Thanks for the help btw. Awesome support! I'd say it's most likely to be a bug within the upstream cp210x driver. I may end up buying one or more of these devices that has this chipset in in order to find out what it really is. For now, you can probably just let SLUB keep catching the errors. You can probably omit U and Z from the debug options and it'll still work (and be a bit faster). Good to know. Thanks. I'll also remove the U and Z from the debug options from SLUB. I do notice that there is about 2x as much processor usage with it on. Another interesting development. The author of cgminer says that it doesn't use the cp210x driver. It uses libusb. What is using cp210x and causing it to crash? There is plenty of probing done by cp210x in the dmesg log, so I would have assumed it was still in control. Perhaps that's why the disconnect messages follow a couple of minutes later. With it unbound from the devices it's out of the picture. The annoying thing is that the stack trace is suspiciously shallow, bottoming out at usbdev_ioctl (which I assume is how libusb "talks" to USB devices). There is plenty that goes on in that function, including creation and freeing of URBs/control message requests. If you're willing to try it, then you can do (as root, not through sudo) echo "Y" > /sys/module/usbcore/parameters/usbfs_snoop. This will create a *ridiculous* amount of spam in dmesg, and probably fill up your SD card, but when you next get a complaint from SLUB it should tell us the last thing libusb called. If it'll help you diagnose the issue then I guess I could give it a try. To prevent filling up the SD card could I start up cgminer, let it run for about 45 minutes (since it looks like the first error happens after an hour), then execute echo "Y" > /sys/module/usbcore/parameters/usbfs_snoop? The problem is that the occurrences of memory corruption are very infrequent compared to the actual number of times that libusb will call the kernel. You may get the first one after 45 minutes, the next after 10 etc. Like I said, probably filling your SD card up in the meantime. I would issue the command immediately after you start cgminer and just bite the bullet. 3) set up a watchdog to reboot the pi if it freezes (it hasn't frozen however). My USB hub can supply a maximum of 3.5A. Each asic can draw 0.51... thus 7 asics is "slightly" higher than the usb. 7 asics was MUCH higher than the original hub. My thinking is that the overdrawing of power was causing a short power outage in some of the asics, thus the usb ioctl wasn't malloc/freeing properly as they kept popping in and out of service. 2) set up a watchdog + starting cgminer at bootup. So long as you are only rebooting once every 30min or less, the downtime shouldn't cost you very many hashes. Thanks for the suggestions masmullin. I have tried mining with just 1 miner plugged into the hub and the pi with still lock up. There doesn't seem to be a correlation with how long it takes to crash and how many miners are being used. Looking over at this post https://bitcointalk.org/index.php?topic=253749.0 Plugging 7 miners in the DLink hub is too many. It sounds like most people are successful with only 6. Since I am only running with 5 I don't think I am running into any power issues. When I say the Pi locks up I mean it REALLY locks up. No keyboard input works and I cannot even ping the pi. So I don't think setting up a watchdog process would help. Using jdb's suggestion and adding slub_debug=FP to /boot/cmdline.txt has pretty much solved the issue. I have been mining non-stop for 3 days now with no issues. I think this means it's most likely a software bug. memory split has NOT been slimmed. cgminer-3.1.1 runs 9-block erupters , 6A P/S, on the old model pi with 256M ram for at least days without incident. The same is true of a new model pi running 2-block erupters. cgminter-3.4.3 will only run for a few hours before locking up the new model pi with 2-block erupters. Two lockups observed before changing back to cgminer-3.1.1 . I guess what I mean is I'm not sure if any code is still running on the Pi. Since I cannot even ping the Pi once it locks up I'm assuming that the kernel is not executing at all. But like I said above, adding slub_debug=FP to /boot/cmdline.txt has completely solved the issue for me. Since adding that my Pi have never locked up.